Daryl Evans Racing JunkYard Cross CX - Excellent Day! The JunkYard Cross CX Race was another GREAT DAY of racing at South Surrey Athletic Park. With the course being the most technical in the VCXC Kazlaw Cup 6 race series, racers had every kind of terrain to tackle. From forest single track, grass rollers in front of Softball City, loose gravel paths, to the Mud Wall which few could ride due to the very muddy conditions - perfect cycloross weather! Very special THANK YOU to title sponsor, Daryl Evans Racing - SUPER sponsor of SORCE for over 10 years! The Red Racer Beer garden served 5 of Central City Brewers and Distillers finest brews - IPA, ISA, Amber Ale, Pale Ale and their latest Beer League Lager. All podium first placers received a 6 pack of lager. The Freshslice Pizza tent served up some excellent pizza served hot and voraciously consumed!! The Race Village was a very busy place with racer and sponsor tents. Gold sponsor The Bike Zone brought complete mechanical support, had a great display of product and provided the racers with a ton of great swag! Norco Bikes had their latest CX bikes on display, Garneau had an assortment of product, and Tairin Wheels showcased their fine wheels and building skills. Little Big Shot Energy drinks and Nitro Lube were on hand to show and sample their products. 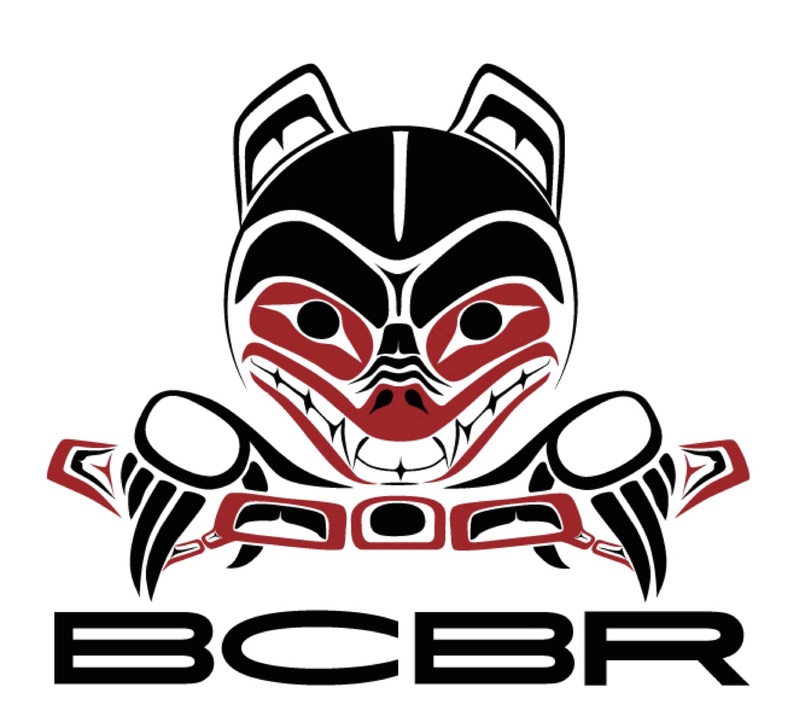 BC Bike Race gave us so much great swag! Clif Bar, Outdoor Gear Canada, Orange, Cycle Lambert, RaceFace-Easton, and Fittek-Today. Every sponsor provided swag prizes and we are very greatful for their generosity. Double R Rentals provided tents, tables, chairs and generators. The City of Surrey are great partners of SORCE and go to great lengths to help make our events so successful. Scott Robarts took hundreds of copyright free photos so do find your mug shot at the link below. THANK YOU all for helping us make the JunkYard CX such a great spectacle! Full race results posted at VCXC. Scott Robarts photographs HERE. 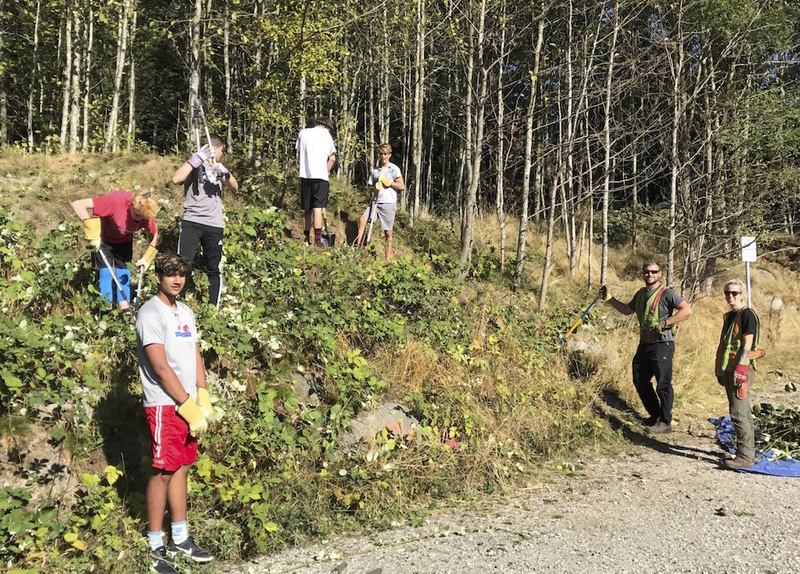 Southridge School grade 10 students and teachers came to South Surrey Bike Park on October 3, 4 & 5 to volunteer trail work in our forest. 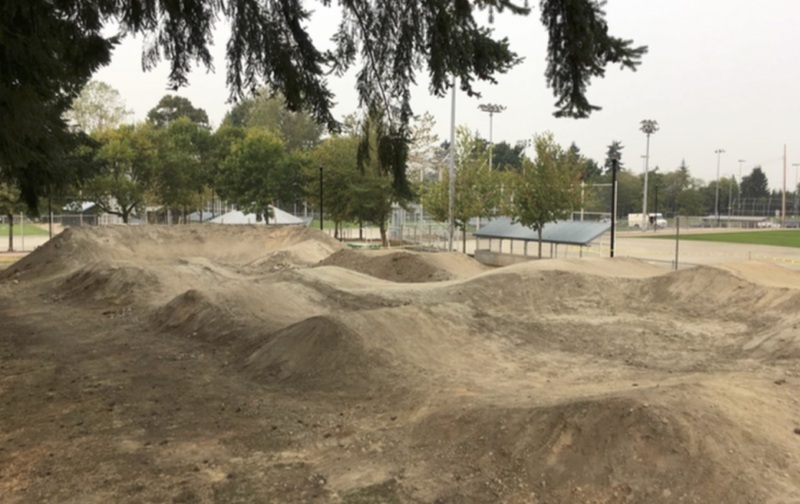 Together with City of Surrey crew; Derek, Chelsie and Steve, and a small SORCE crew, the 16 students and teachers sifted, wheelbarrowed, placed, raked and stomped our golden dirt into refreshed berms and rollers on Chainless. Those pesky Blackberry bushes were again promptly cut back and root balls removed. We were truly lucky that all three days had beautiful weather to make for a very enjoyable week. The last day SORCE provided a pizza lunch for the voracious group! 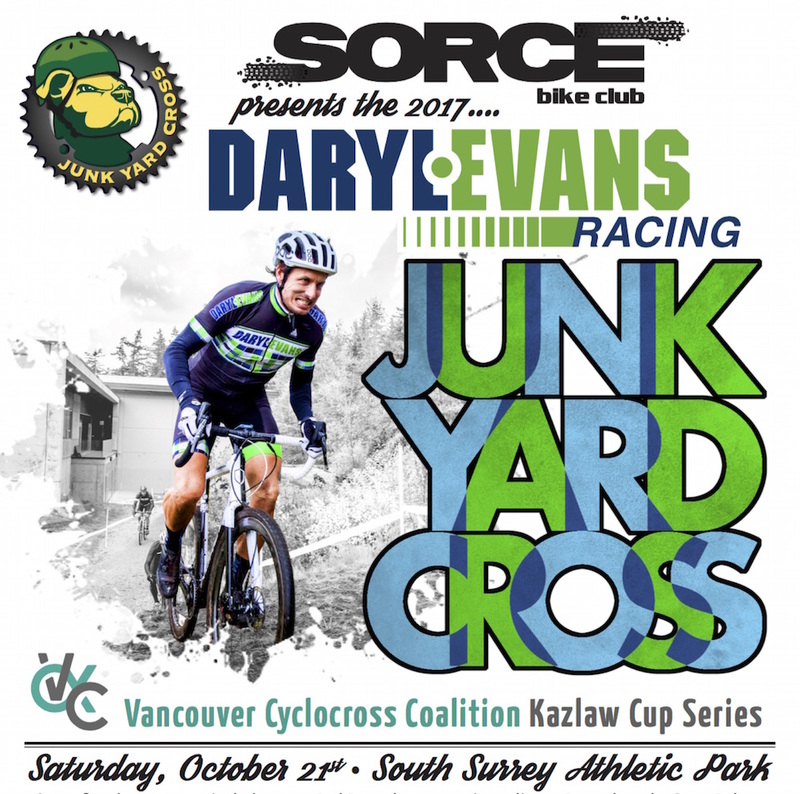 The Daryl Evans Racing JunkYard Cross Race is on Saturday, October 21, 2017. Each registrant receives a Red Racer beer, slice of pizza, and a pro photo from Scott Robarts. Tons of swag, Red Racer Beer Garden and great CX racing at it's very best. Kids Race Fun Day - Awesome! The 2017 Kids Race Fun Day was fabulous as the rain held back to make for a great race! The Physiomoves bouncy castle was well used, the pizza was voraciously consumed, the South Surrey Cycles swag draw was eagerly anticipated and together with the Clif Bars kids Z-Bar, every kid went home with a smile and some cool stuff! The SORCE crew was again so pleased to see the 32 kids tear up the BLT course. 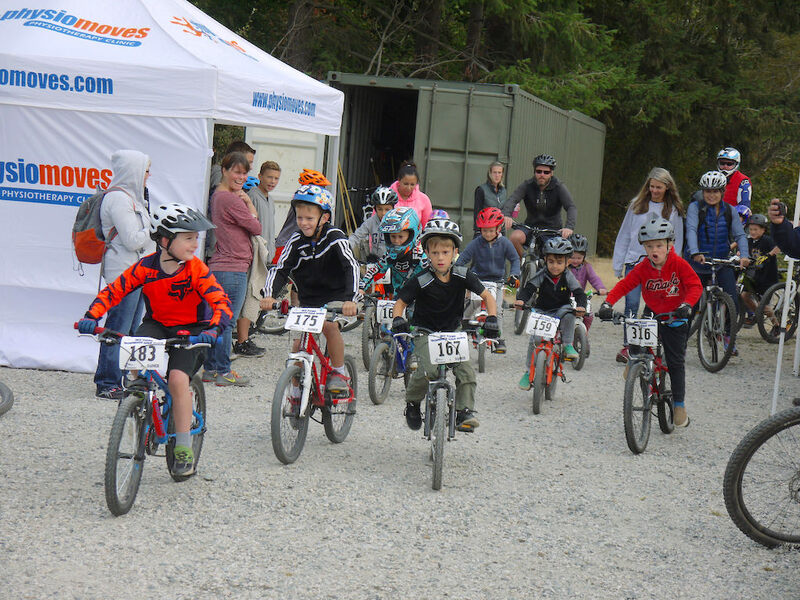 Thank you to Physiomoves Physiotherapy and South Surrey Cycles for making another Kids Race so special. See all the action on photos posted to our Flickr page HERE. The Cap's South Shore Cycle Shed CX Toonie was the best SORCE Toonie race EVER! 71 racers competed over three categories, with race starts at 10, 11, and noon. Pulled pork in a bun with coleslaw and chips were gobbled up and for only $2, no wonder! An assortment of beverages were also available for $2. 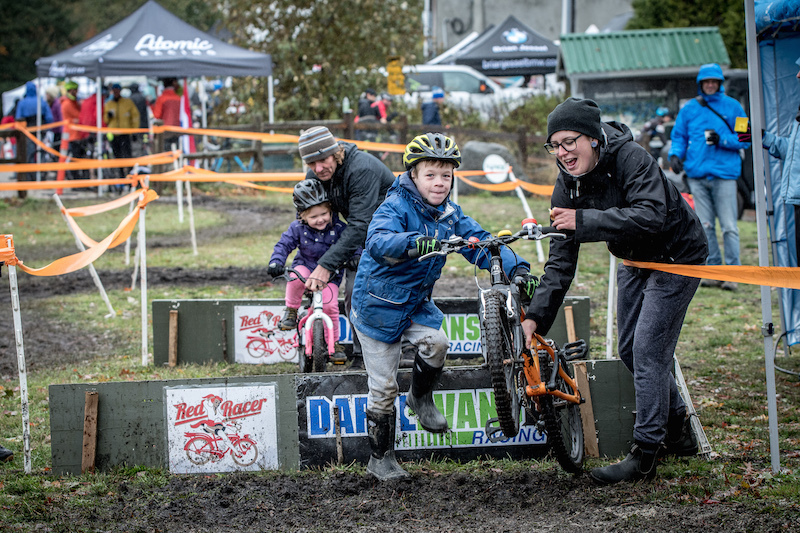 Thank you racers for making our first CX Toonie race such an awesome event! Swag was graciously provided by Cap's South Shore Cycle, with mechanics Dustin and Brock providing full complementary service. 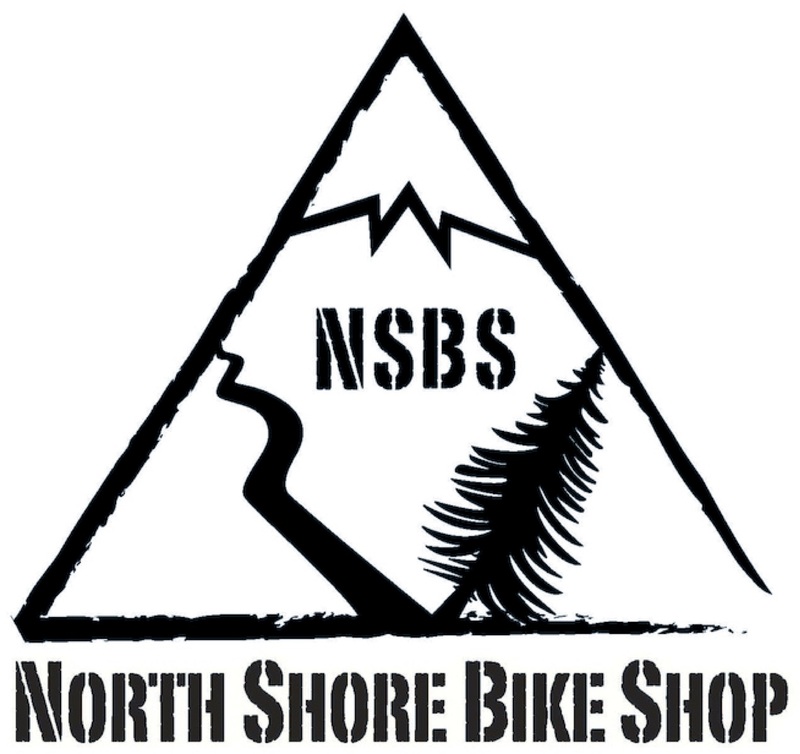 Thank you Cap's South Shore Cycle! The SORCE Kids Race Fun Day is all set to go on Sunday Sept 17, with registration open at 9am and the race at 10am. 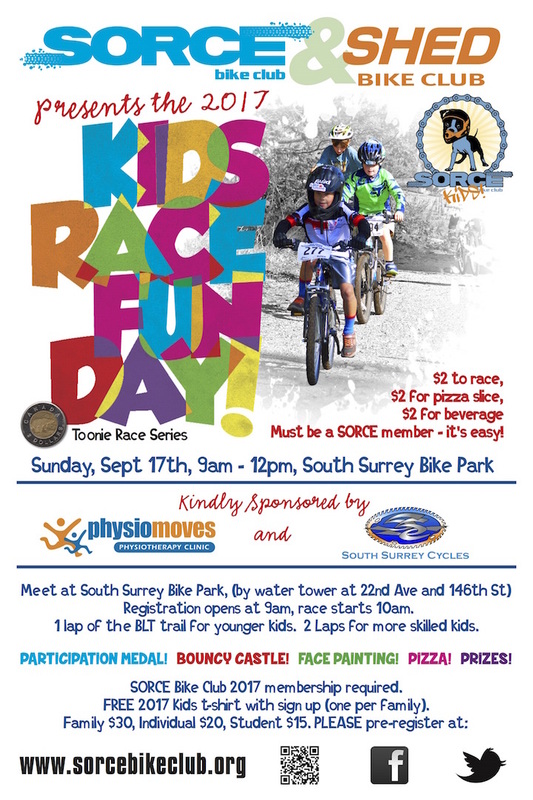 Facepainting, bouncy castle, medals, pizza and cool prizes from South Surrey Cycles. PLEASE register online by renewing your membership for 2017 and on Webscorer for the race. New kids t-shirt for 2017. All links and details HERE. 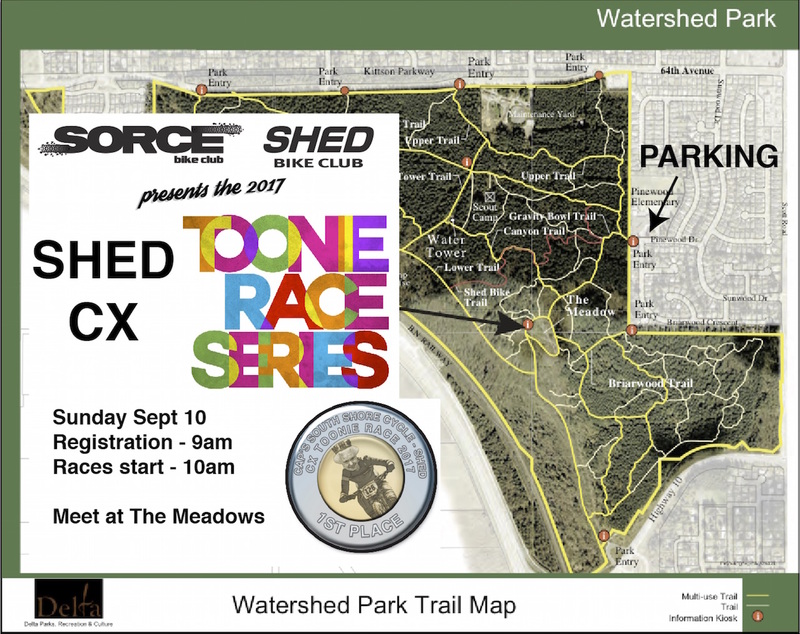 The 4th race of the Toonie Race Series is a Cyclocross race and it's this Sunday, Sept 10. Meet at The Meadows - 9am to register and 10am first race start. 3 categories - Beginner 20mins with mtn bikes ok, Intermediate 30mins CX bikes only, and Expert 40 mins CX bikes only. Updated from end of August - OPEN. 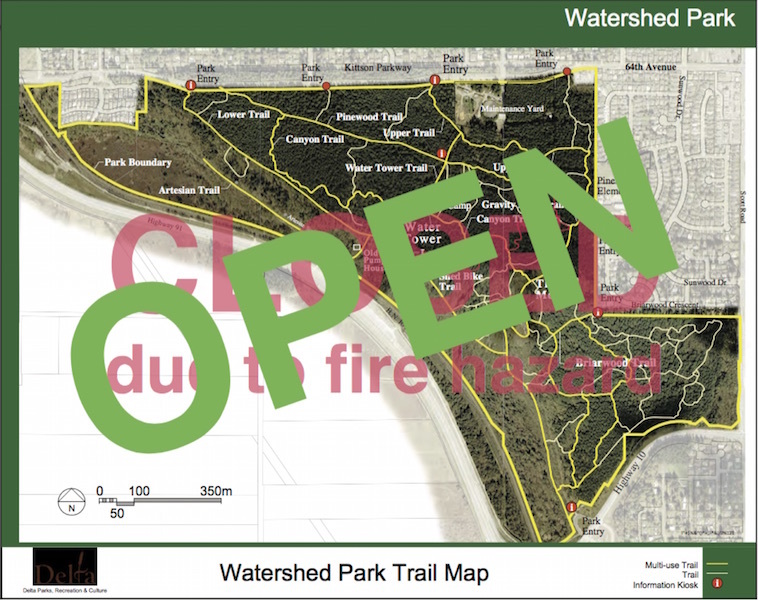 The Delta Watershed Park has been closed due to the extremely dry conditions. Please respect this closure and help protect one of the jewels in our crown of great places to hike and ride. James and John visiting from Pemberton, get a guided ride of SSBP over the July long weekend from Owen and dad Darren.